CLOUD-CON: Integration & Web APIs is a multi-vendor online event focused on delivering integration between on-premise, cloud, SaaS and trusted outside communities. Experts will discuss API Management, Cloud / SaaS Integration, Federated Identity, Master Data Management and more. The webinar was hosted and made available by Integration Developer News. View the on-demand recording today! As an ISV, dealing with data integration and connectivity challenges for you and your clients can be a source of headaches and sleepless nights. 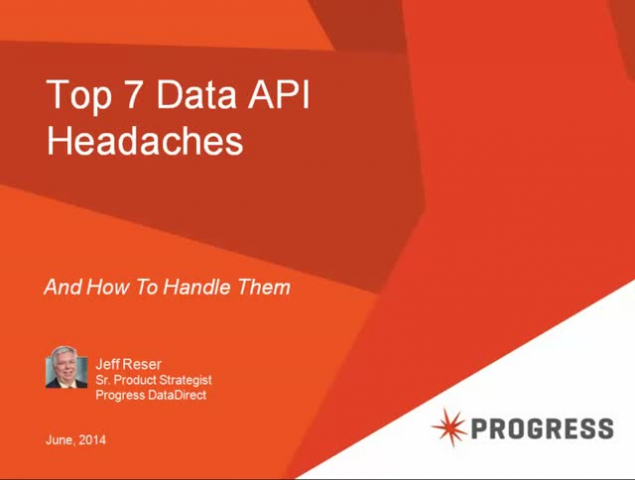 In this complimentary on-demand webinar, we explore best practices of how these data API headaches can be triaged and treated with simple approaches involving cloud-based services and more showing how to most efficiently access the right data to help businesses transform vital information into actionable insights. If you need to transform MongoDB data for SQL appliations you're not alone! New, specialized NoSQL technologies like MongoDB provide powerful new technology to build agile, web-scale solutions. But integrating business critical data from MongoDB into your applications is no easy feat. Expose MongoDB data the way SQL applications have come to expect. Integrate MongoDB data without flattening documents, duplicating data, or changing column structures. Expose critical business data stored in MongoDB without losing speed and reliability. Efficiently query nested constructs within JSON documents with SQL. Progress DataDirect features superior and dependable data connectivity and integration. You understand your customers and your community, and what decisions need to be made. DataDirect gives you fast, reliable access to your data, on-premise and in the cloud.